Rescuers in Baghdad have given up the search for survivors in the rubble left by a massive blast which killed at least 17 people, most of them Iraqis. The explosion on Wednesday night wrecked the small Mount Lebanon hotel and nearby houses in the city centre. The US military says a 450kg car bomb packed with artillery ordnance killed at least 17 people and injured 45. On Thursday, three people also died in an attack on staff at a US-funded TV station in Baquba, north of Baghdad. US officials say the hotel attack, in the busy Karrada district, was intended to cause maximum casualties and bore the hallmarks of an al-Qaeda-related group. One Briton was killed, and another injured, the UK government said. US officials initially put the death toll as high as 27, but later revised it downwards. Iraqi officials said the toll was as low as six. Hours after the blast, a mortar attack on a US logistics base north of Baghdad killed two soldiers and injured six. Most of the victims of the hotel bombing were Iraqis living nearby, rescuers said. The hotel was used mainly by Iraqis and foreign Arabs. It is the latest in a wave of bombings that has killed more than 400 people in Iraq since February. BBC correspondent Suzy Price, who stayed at the hotel last summer, described it as a small, friendly guest house, but without the security precautions - like roadblocks - employed by the major hotels. "They simply had one night watchman, who was armed during the night," she said. The BBC's Tim Franks in Baghdad says there was anger at the scene, most of it directed at the Americans, with local people claiming the hotel was hit by a missile from a US aircraft. A US military spokesman said the attack appeared to have been directed at civilians. "There were no coalition forces operating in the area at this time, so the coalition was not the one being targeted," he said. One report quoted a US officials as saying the attack was carried out by a suicide bomber. 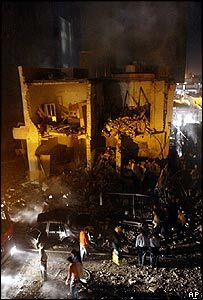 The explosion left a crater around seven metres (20 feet) across and 3.5m deep in the road outside the hotel. On Thursday morning survivors were picking through the remains of their houses and their businesses, but rescuers had left the scene. Tim Franks says there is a mass of masonry, tree trunks and car parts - the dust and greyness streaked in places with thick smears of blood. A US spokesman said that the bomb used suggested the involvement of an Islamic extremist group such as Ansar al-Islam or followers of suspected al-Qaeda operative Abu Musab al-Zarqawi. The BBC's Caroline Hawley says that with security arrangements tight around Baghdad's bigger hotels, a smaller one like the Mount Lebanon would have been a soft target. Bricks, air conditioners, furniture, wires and other debris lay scattered hundreds of metres from the hotel from the force of the explosion. Witnesses said children were among the victims and one man was seen cradling the limp body of his young daughter as rescuers moved survivors to ambulances and other available vehicles to take them to hospital. A White House spokesman said the new attack would not deter efforts towards "democracy, freedom and stability" in Iraq where the US-led coalition is on high alert in the run-up to the first anniversary of the start of the war on Saturday. "People were killed as they were sitting down to dinner"